Vanities. White Metal Finish Vanity Set With Porcelain Set, Features Rectangular Glass Top Table With Glass Shelf And Round Top Rectangular Mirror And Stool With Padded Seat In Mauve Velour Cover. 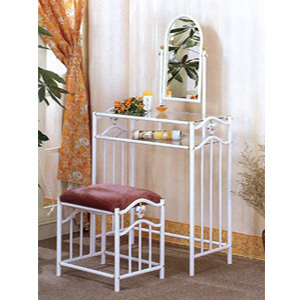 Details: Vanity: Width: 32-1/4 x D: 14-1/2 x Height: 56. Stool: Width: 20-1/4 x D: 14 x Height: 17-1/2. Strong Construction. Easy To Assemble.